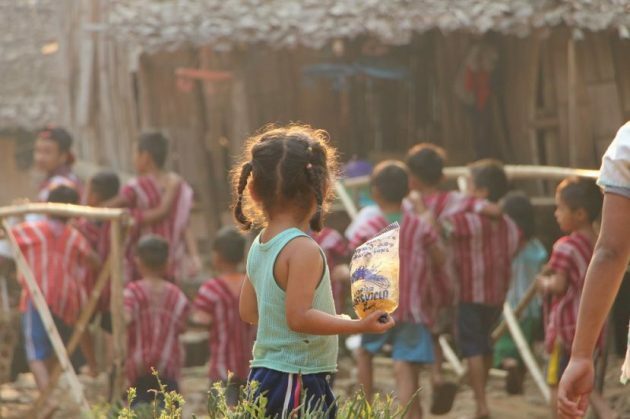 With donor-supplied food rations set to stop soon, internally displaced families in Karen State say they are worried about their future, yet have little recourse. Donors are expected to discontinue food aid at five camps in Karen and Shan states as of September in a move that could affect around 9,000 people. “If the support stops, it will not be easy for us to return to our villages,” said Saw Nyar Tae, chairperson of the Ee Tu Hta camp in Hpapun township, one of the locations expecting the cut. He added that many of the displaced families want to return to their homes, but after witnessing decades of armed conflict, they are dubious about whether the current peace will stick. The Karen National Union (KNU) and the Democratic Karen Buddhist Army (DKBA) both signed the Nationwide Ceasefire Agreement (NCA) with the government in 2015, but soldiers from all sides, including the Tatmadaw, maintain a heavy presence. After armed skirmishes briefly reemerged last year, many IDPs felt their worst fears were substantiated. Even without active combat they say they have reason very caution; Karen State continues to be riddled with landmines and leftover ordnance, with planned clearance operations yet to get started. Saw Nyar Tae said if families choose to remain in the IDP camps without donor support they will be confronted with the immediate problem of no livelihood options. “There are a large number of refugees here and there is no place to do farming. So we would face difficulties surviving here [without donor assistance],” he said. Donors have provided regular deliveries of rice, but have warned the Ei Tu Hta camp officers that will soon have to end. “Donors let us know that they can guarantee the support only until September due to a decrease of outside help,” Saw Htoo Klie, director of the Karen Office of Relief and Development, told Karen News. He added that there have not been any preparations to resettle the 3,000 people currently living at the Ei Tu Hta camp, which was set up in 2006.